Lake Texoma, the largest lake in capacity in the Tulsa District and the twelfth largest in the United States. Located on the Red River and constructed in the early 1940's as a flood control project, Lake Texoma covers 140,000 acres and has over 600 miles of shoreline. It is estimated that 8.5 million people visit Lake Texoma every year. Texoma ranks second overall in visitation nationwide. This lake is shared by Texas and Oklahoma. Lake Texoma is famous for it's trophy striper fishing. Lake Texoma is a great vacation destination for everyone. Popular activities include sailing, camping, golfing, hunting, and boating. You will also find beautiful coves, islands, and sandy beaches at Lake Texoma. Lake Texoma is widely recognized as a top fishing lake, and is one of the most popular recreation destinations in the Southwest. Lake Texoma was built by the Corps of Engineers in the 1940's, and was stocked with black bass and crappie along with the native white bass in the Red and Washita Rivers. The introduction of the striped bass has been very successful. 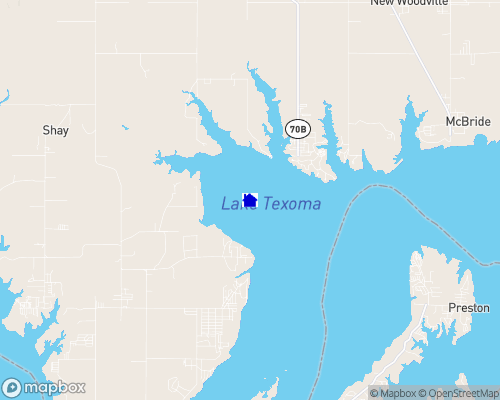 Texoma is known as the “Striper Capital of the World.” This lake is one of the few reservoirs in the nation where striped bass reproduce naturally. Other popular species include largemouth and smallmouth bass, white bass, hybrid striped bass, white crappie, black crappie, channel catfish and blue catfish. On Lake Texoma, the fish limit is 10 Stripers per person with only two 20" or longer per person. Lake Texoma is also thought to be the “Playground of the Southwest.” The lake offers a multitude of amenities for most anyone who enjoys the great outdoors. There are many different campgrounds with the total number of individual campsites reaching well over 800. Also available are 40 miles of equestrian trails that are enjoyed by hundreds each year and the scenic Cross Timbers hiking trail, a very popular trail that winds for 14 miles above the lake on rocky ledges and through blackjack woodland. Overnight accommodations, boat rental, slip rental and supplies are available at many of the 23 commercial concessions located adjacent to the lake. For more information on private resorts and concessions, please contact the Lake Texoma Association at 580/564-2334. The lake area includes two wildlife refuges, two state parks, fifty-four U.S. Army Corps of Engineers-managed parks, twenty-six resorts, hundreds of campgrounds and a variety of excellent golf courses. Power boating, parasailing, personal watercraft, water skiers and windsurfers all consider the lake an excellent place to have fun. For more information: Surf Oklahoma THE starting Point for Oklahoma!